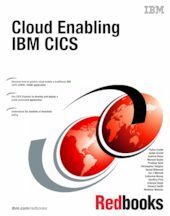 This IBM® Redbooks® publication takes an existing IBM 3270-COBOL-VSAM application and describes how to use the features of IBM Customer Information Control System (CICS®) Transaction Server (CICS TS) cloud enablement. Working with the General Insurance Application (GENAPP) as an example, this book describes the steps needed to monitor both platform and application health using the CICS Explorer CICS Cloud perspective. It also shows you how to apply threshold policy and measure resource usage, all without source code changes to the original application. In addition, this book describes how to use multi-versioning to safely and reliably apply and back out application changes. This book describes how CICS TS cloud enablement uses existing operational facilities, including monitoring, events, transaction tracking, CICS TS bundles, and IBM CICSPlex® System Manager (CICSPlex SM), to integrate with existing deployment and management processes.